Back in Tassie | Decks Awash! We are back in Tassie and like any paranoid skipper, the first thing I did was check on my beloved boat. Apparently all y’all have been having some windy weather during our two week absence. ERIK must have been knocked about in some strong gusts and been pitching a bit, because she had almost, very nearly, almost completely sawed through the mooring strop. Pacci Stronach, a man to whom I now owe a debt of gratitude, runs the local shipyard and tends to the moorings out in the bay. He was out there last Friday preparing a new mooring to lay and thankfully thought to check on ERIK on his way back. With the wind piping up, he saw the tattered remains of the strop and using a length from the new mooring he was preparing, doubled up the strop. When I called Pacci to ask if I could nick a dinghy to check on my boat, his first words were “you are lucky you still have a boat”. You can see the frayed original and the doubled strop Pacci hitched on. Also note the flared cheek of the bow roller. That’s 7mm bronze plate. The forces required to bend it must have been considerable. 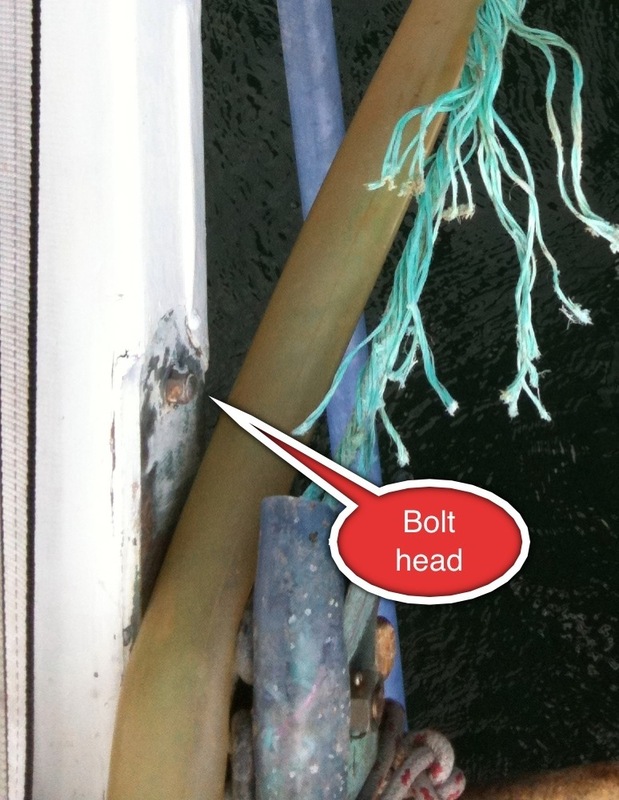 We removed the anchor from our second bow rode, shackled its chain to the swivel on the head of the mooring… And moused it with wire for good measure. We then shackled a heavy piece of line to the chain and hitched it to the Samson posts on the foredeck. Taking the strain on the chain, we then cut the stuffed rode free, and took off the doubled up strop Pacci had put on… For peace of mind, we then decided to put the doubled up strop back on, but shackled it in place instead. 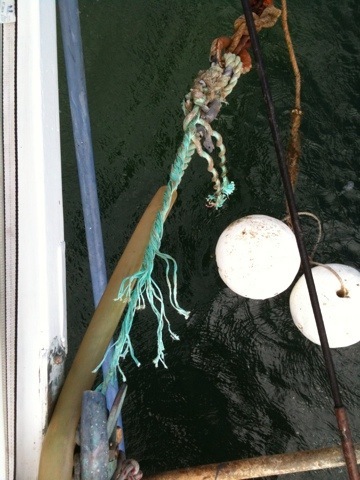 What we have decided to do to stop this happening again is make our own mooring strop out of chain. I’ll take a length of chain and shackle two heavy line eyes to each end of it. To pick up a mooring, we’ll put one of those eyes over the Sampson post and thread the other end through the mooring strop and drop the other eye over the post, capturing the strop in a loop of chain. That way the chain sits on the roller and takes all the chafe, and the mooring strop isn’t anywhere near anything that can harm it. To that end, I went into town today and got the necessary bits and pieces to make it tomorrow. I’ll also splice up a new strop to replace the one ERIK ate, and shackle it to the mooring. We went away a bit naive about moorings, having relied on our anchor in the past. We now considerably more and are lucky to have the foresight of good people to help us learn these lessons without too much pain. But bloody hell, it was a close thing. I have enjoyed browsing and experiencing your travels as an armchair traveller. What a lot of work to get away and do hope Erik is now rehabilitated. Love your photos and journal accounts! What an experience for you all! Good luck and will await further news. glad to see you have made the Tamar. Sounds like it was a bit more exciting than we used to get off Long Island Lis..